This zany game pairs "awkward family photos" with lines from favorite movies. A family picture's worth a thousand words--or a million if it includes matching outfits, jazz hands, awkward animals, and over-the-top smiles. 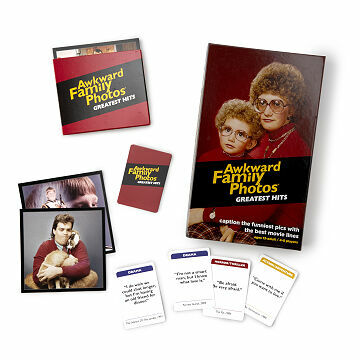 All the elements of an epic game night await, as players compete to apply the best caption to awkward family photos using offbeat, dramatic, and action-packed lines from hundreds of memorable movies. One player assumes the role of 'The Critic,' choosing the next cringe-worthy image from the collection of 160 awkward photos. The other players choose from eight movie quote cards in their hands to pitch the best caption for the photo, and then the Critic determines the winner of the round. No knowledge of movie trivia is required--just an appreciation for the quirky humor of Hollywood-meets-family album. Made in Indiana. Well received as a birthday gift! Looking forward to sharing in the fun! Perfect for Family Game Night! We play games on family night and all the holidays. This was a fun, interactive addition to our game collection. Lots of laughs happened while playing this game. Packaged very well I accidentally got the box wet and nothing got damaged so that's good. This game is so fun and so easy. The pictures are hilarious and it's so funny when you get the perfect movie quote to match. I love this game because it's not insanely challenging and anyone can play it! I honestly hate playing games, and my husband loves them, so if I ever get him one that I know I'll have to play too I make sure it's one that will grab the attention of game lovers and game haters alike. Even though I don't like playing games, I do enjoy this one. I really is hilarious! I would definitely recommend it. After 3 yars, Our extended family got together for Thanksgiving... It normally takes some time to get acclimated, so I brought out this game the first night...and oh my, what a difference it made!! Everyone lightened & loosened up like never before & laughed the night away! We were still quoting some of the lines the next day & laughing & can't wait to use it again! This is a total hit & esp great for families that aren't always at ease spending holidays together. I'm recommending it to my friends for the Christmas holidays! Arrived in good condition and look entertaining. I'm happy with it. So much fun! Such a great purchase! This game is so much fun! The only suggestion I have is to make a booster pack to sell and give people even more fun cards!